Yes. I’m in the car. Going somewhere. But you’ll have to come back on Monday to see where I’ve been. Woooot! I’m a traveling guy! 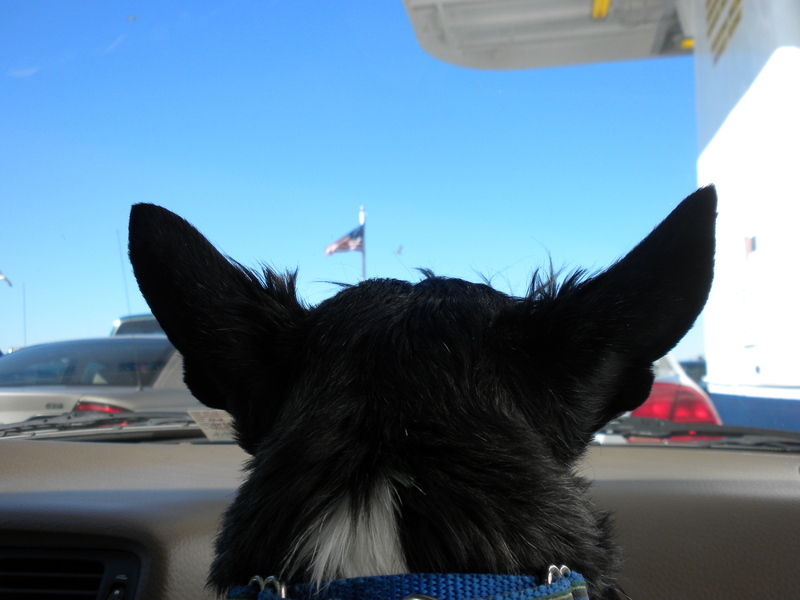 This entry was posted in dog adventures, dogs, pets, Scotties, travel, traveling dogs. Bookmark the permalink. 11 Responses to Where In The World? This is easy. You’re in a traffic jam and aren’t going anywhere. Looking through your ears reminds me of watching TV in my house. You block out all of the good things. Looks like an airport to me. Are you taking a trip on a big bird? Are you on a ferry ride? Or perhaps going through a toll gate? Wherever you end up – hope you have a great day!!!!!! We’re thinking it’s an airport, Stuart. Somehow the traffic, the building with the overhang roof and the American flag seem to fit. Maybe you are making a drop off or a pick up? If only there was a low flying plane in the sky we’d be positive. Wherever you’re going we hope it’s lots of fun! Love the ears..bet you don’t miss a word. Have a great time. Have fun on your car ride!